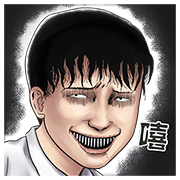 http://www.line-stickers.com/ – The Creepy World of Junji Ito Line Sticker | Step into a masterful world of horror from the famous manga artist, Junji Ito. He lends his talented pen to some of the creepiest stickers around. Add a bit of spine-chilling fright to your chats today! Publisher : Asahi Shimbun Publications Inc.